Québec City and Montréal are cities well worth an adventure, but the province of Québec isn't all bright lights and life in the fast lane. If you're willing to hit the road, it won't be long before you reach the village of Mont-Tremblant. 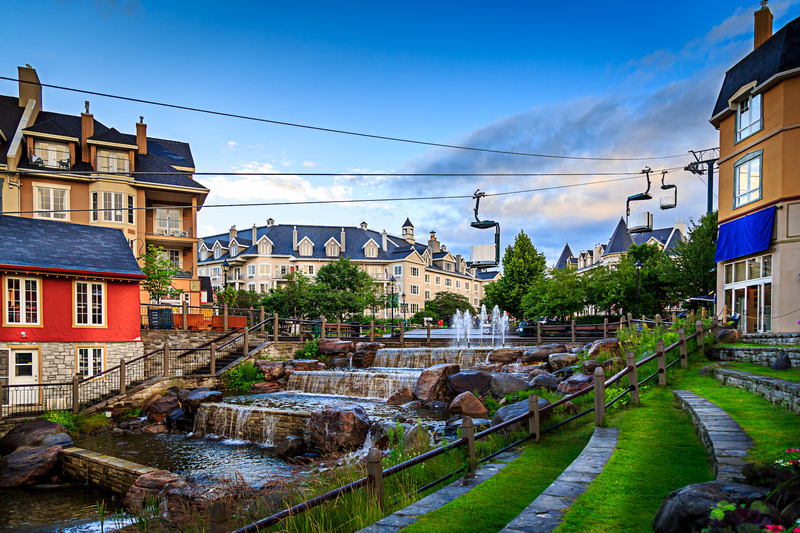 It's always described as a "village," and Mont-Tremblant personifies that word. White buildings with brightly-coloured accents rise above cobblestone streets; the Laurentian Mountains tower in the background. The town is home to the second-oldest ski resort in North America, which received a big makeover in the 1990s when it was acquired by a new operator. The resort is just north of the village, and when you visit, you should take time to explore both. The greatest part about Mont-Tremblant? It's just as beautiful and full of activity in the summer as it is in the winter, so there's no bad time to road trip here! "Québec" is an Algonquin word that translates to "where the river narrows" and the entire province was frequently referred to as "La belle province" or "the beautiful province". Since its founding in 1763, the predominantly French-speaking Québec has retained a unique cultural identity. In fact, it actually has multiple identities that very much complement each other: It's both European and North American; cosmopolitan and naturally wild. City folk will enjoy the sophisticated metropolises of Montréal and Québec City and in particular the historic charm of Old Québec. Those more inclined to a holiday outdoors will want to escape to the Eastern Townships and spend time along the coast. Canyon Sainte-Anne is one of those places you really have to experience at least once in your lifetime. It's a monumental achievement and a natural wonder in every sense of the phrase. A waterfall flows down into a canyon and offers visitors an up-close-and-personal tour via one of the three suspension footbridges that go across the canyon. The gorge was carved over time by the Sainte-Anne-du-Nord River, just a short distance away from Beaupré, Québec. For you sci-fi aficionados, this canyon may be familiar if you loved the movie Battlefield Earth (yeah, the one with John Travolta playing a weird Klingon-esque alien warlord). There's loads to do in the surrounding area, like visiting the Sainte-Anne-de-Beaupré Basilica, the Mont Sainte-Anne ski resort, Montmorency Falls, and the Cap Tourmente National Wildlife Reserve. Speaking of Montmorency Falls, this year-round waterfall park is further proof that Québec is not to be trifled with when it comes to natural wonders. Located only a few minutes from downtown Québec City, these falls are actually higher than Niagara Falls! Just like Canyon Sainte-Anne, there are a few ways to enjoy the view. You can take a cable car, walking tour, cliff-top footpath, suspension bridge, cliffside staircase, or experience the waterfall via a double zipline. Walk through over 300 years of history at the Citadel of Québec, a fortress that's still operating as an active garrison, home to the Royal 22e Régiment. Built between 1820 and 1850, this impressive piece of architectural achievement remains the largest British fortress in all of North America. Located on Cape Diamond, the star-shaped fortress offers guided tours of the various structures, including a 19th-century military prison! Tours are offered in both English and French, and should you visit between June 24th and the first Monday in September, you'll be able to see the Changing of the Guard. It doesn't get more charming than Old Québec, and should you find yourself strolling along the historic streets, wander over to Rue Sainte-Ursule for a ridiculously charming meal at one of the best restaurants in the province, Restaurant Le Saint Amour. There's a year-round interior garden and some of the most unforgettable meals. One of the coolest hotels around is arguably the Hôtel-Motel Coconut, on Le Chemin du Roy, near downtown Trois-Rivières. This hotel is kitsch at its absolute finest. It was established over 50 years ago and is still going strong. The best part: The onsite Polynesian-inspired tiki bar. It's like being on a tropical island... in the middle of Canada! It's just a short walk to the St. Lawrence River, and right off Highway 138. Fort Richelieu was built in 1641 along the Richelieu River, as one of five forts designed to protect travellers along the river. In fact, the entire area surrounding Fort Richelieu is known as "La Vallée-des-Forts." So, prepare to unleash your inner history buff and step back into the 17th century. The Notre-Dame Basilica de Montréal is one of the most beautiful buildings on the continent. It was built between 1824 and 1829, and at one point was the largest church in North America. Its Gothic Revival style is insanely opulent and literally sparkles with rich reds, deep blues, purples, and glittering silver and gold stars. There are hundreds of wood carvings, and massive stained glass windows that depict scenes from the early days of Montréal's religious history. There's also a Casavant Frères pipe organ, which dates back to 1891. This incredible piece of musical equipment is 32 feet long, has four keyboards, 7,000 pipes, and 92 stops using "electro-pneumatic action and an adjustable combination system." It's pretty rad, to be honest, and visitors can go on a tour and even sit at it. Oh, and if that's not reason enough to visit, this is also where Celine Dion got married in 1994 to René Angélil. Parc Jean-Drapeau is just east of downtown Montréal, just along the Saint Lawrence River. The park is actually two islands, Saint Helen's Island and Notre Dame Island. Built for the Expo '67 World's Fair (themed "Man and His World"), both islands are actually artificial. The islands hosted pavilions that represented more than 60 countries from around the world. Currently, the island park is home to an amusement park, a casino, an environmental museum, a historic fort, a Formula-1 racetrack, a music venue, a pool, and a beach. There's also plenty of hiking, biking, and skiing trails. When it comes to whimsical wonderlands, it doesn't get more beautiful than the Montréal Botanical Garden (AKA Jardin Botanique de Montréal). This sprawling wonderland is full of themed gardens and lush greenhouses, and is, in fact, a National Historic Site of Canada. In addition, it has won global acclaim as one of the top botanical gardens in the world, due to its extensive collection of flora and fauna. Founded in 1931, the garden defied the odds by opening during the Great Depression. Architecture buffs will love the Art Deco building, which was designed by famed architect Lucien Kéroack. There are also three other natural attractions in the city: the Biodome, Insectarium, and the Rio Tinto Alcan Planetarium. The Restaurant Auberge Chez Girard is a quaint little restaurant and inn that's located in Sainte-Agathe-des-Monts. Its waterfront location is just a short five-minute walk from the beach. The restaurant serves wild game, and due to its proximity to the water, delicious seafood as well. Mont-Tremblant (from the Algonquin for "trembling mountain") is one of the most beautiful cities in all of Canada. The former logging town was settled in 1872, and has retained its historic charm, from cobblestoned streets to brilliantly-coloured buildings. Tucked away in the Laurentian Mountains of Québec, it's probably most famous for its ski resort, but it's so much more than a ski town. There are loads of opportunities for outdoor activities year-round, like hiking, dogsledding, golfing, ziplining, canoeing, fishing, etc. The city is also home to the Circuit Mont-Tremblant race track, which hosts the Champ Car World Series, Trans-Am, and Formula-1 races. One of the best places to stay in Mont-Tremblant is the Hôtel Quintessence, a truly lush lakefront boutique hotel just a few minutes’ walk from the village. When planning your visit, keep in mind that ski season runs from November through April. But don't just limit yourself to outdoor activities! Why not enjoy a fondue tour or just spend a weekend in a log cabin cuddled up with some maple syrup delicacies? Also, if you want to really get back in touch with nature, head to the Scandinave Spa, where there's a no-talking policy at the outdoor hot tub. It's totally worth it when you see deer frolicking past you while you're soaking. No visit to Mont-Tremblant is complete without checking out Versant Soleil, it's one of America's only ski-in, ski-out casinos! Mont-tremblant village on a beautiful day.